A bold vision that puts social and environmental wellbeing at the core. Last week there was a summit of EU leaders with key issues for Europe’s future on their agenda, including migration, security, jobs and Brexit. It was the same week that marked the one year anniversary of the UK’s vote to leave the European Union which propelled questions about the future of Europe right up the political agenda. 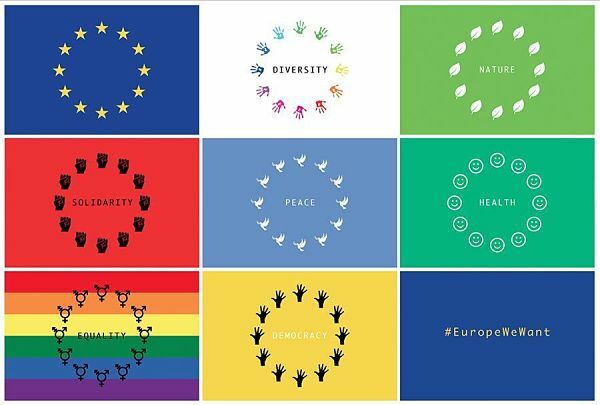 And more than 250 non-government organisations from across Europe released their alternative vision for a more democratic, just and sustainable Europe. The organisations are putting this scenario for the future forward as an alternative to the five proposals presented by the European Commission’s President Jean-Claude Juncker, because, as Leida Rijnhout, speaking for SDG Watch Europe and Friends of the Earth Europe, explained: “The five scenarios for the future of Europe put forward by President Juncker are all deeply disappointing and have little connection to the challenges that the European Union faces. “Instead we need a bold vision – an alternative sixth scenario – that puts social and environmental wellbeing at the core. In a scenario where sustainability is at the heart of the European project, the EU27 will prioritise the interests of citizens, in the EU and beyond. 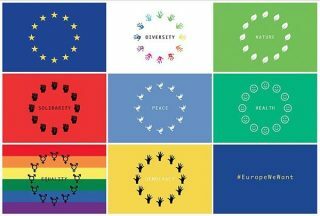 Europe will focus strongly on Europe’s core social values – democracy and participation, social justice, solidarity and sustainability, respect for the rule of law and human rights, both within Europe and around the globe. Citizens seek economic, social and environmental wellbeing. Economic wellbeing in the form of prosperity for all, starting with redistribution of wealth. Social wellbeing in the provision of quality, inclusive and affordable public services, the promotion of cultural diversity and a caring society. And environmental wellbeing residing in a healthy natural environment that sustains all life on Earth and protects our soils, waters and air, provides nutritious, healthy food and where climate change is minimised. As a result of this focus, the EU27 will ensure a better health and quality of life for its citizens. This will increase public trust in European institutions. It will move away from the current focus where commercial and corporate interests are all too often prioritised over the public interest. Decisions are made in the public interest, and transparent, accountable and inclusive institutions will be the norm. The EU27 will ensure that policies agreed by the Member States are fully implemented and enforced. Scandals like Dieselgate, which caused tens of thousands of premature deaths, will not be repeated. Delivering the 2030 Agenda for Sustainable Development, including the principles and Sustainable Development Goals: leaving no one behind, living within Europe’s fair share of our planetary boundaries, and putting respect for human rights at the core of EU and national policy-making. The full implementation of the Paris Agreement by decarbonising our economy, enhancing energy efficiency and accelerating the just and sustainable transition to clean and affordable renewable energy, based on the principles of climate justice, in order to limit global warming to 1.5°C. The notion of ‘Better Regulation’, implying that all EU policies, laws and regulations are focused on ensuring policy coherence for sustainable development and on enforcement of high standards for jobs, health, safety and the environment, delivering tangible benefits to all citizens and the regeneration of environmental capital. Policy coherence as a key objective will result in an end to negative externalities of domestic policies for the Global South and the phasing out of perverse public subsidies, especially for unsustainable food production and fossil fuels. Companies and their subsidiaries outside the EU and throughout their supply chains will be under a legal obligation to assess, mitigate and prevent negative environmental and human rights impacts of their business activities globally. International trade is recognised as a means to achieve social, environmental and economic objectives, not an end in itself. A positive agenda for trade and investment agreements will be designed primarily to advance wellbeing and the public interest instead of cost reduction for companies. Europe will raise the bar for all other regions and actively discourage a race to the bottom. Through strengthening representative and participatory democracy and ensuring civic space for people’s participation beyond elections, citizens can better engage with the European project and shape a positive European vision for the future. The EU27 and the Member States will consider education as a public responsibility that offers lifelong learning for all in order to develop active citizenship, critical thinking, social inclusion, cultural diversity and an understanding of sustainable development and human rights. Gender equality and women’s and girls’ rights will be priority in all EU policies and practices, both domestically and externally. A just transition to a green and socially fair economy, in which our human and natural resources are cherished, within the planetary boundaries. A European Social Model provides full protection to all workers, all consumers and all generations of people living in the EU. Effective and coordinated taxation measures ensure that all companies pay appropriate taxes and contribute to national public budgets for socio-economic wellbeing. The EU27 will effectively fight tax evasion and close down European tax havens. To read the pros and cons of Scenario 6, click here. Scenario 6 was initiated by and Friends of the Earth Europe and SDG Watch Europe, a new, EU-level, cross-sectoral CSO alliance of NGOs from development, environment, social, human rights and other sectors. Its goal is to hold governments to account for the implementation of the 2030 Agenda for Sustainable Development (SDGs). To see the list of organisations that have signed up to Scenario 6 – 256 at the time of posting – click here.